Are you ready for Easter? What are your Easter family traditions? We head over to grandma's house to do our Easter egg hunt and dinner!! 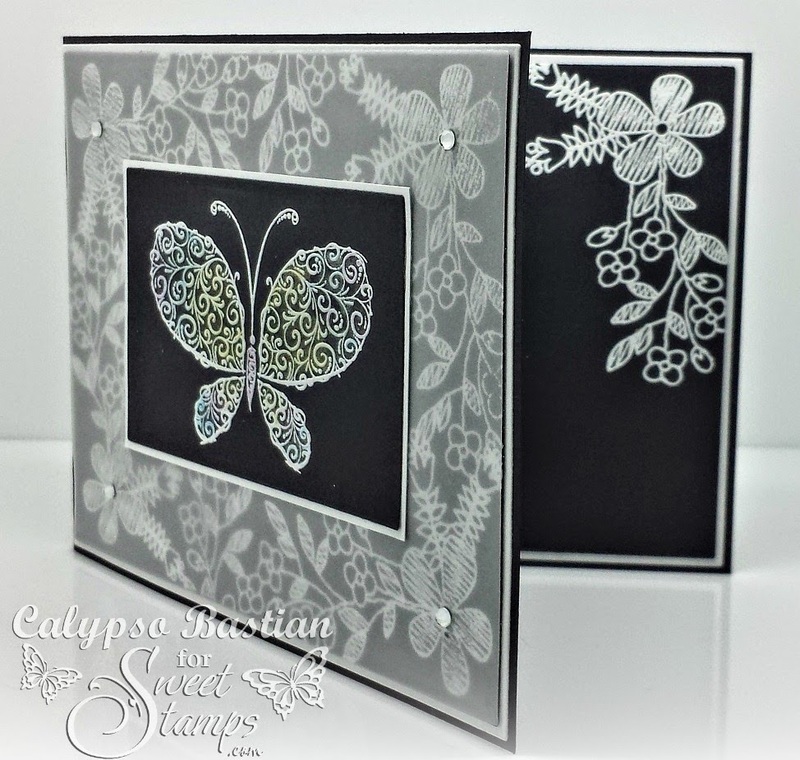 Today at SweetStamps we have a new challenge for you!! It's also a combined challenge since it's the 15th of the month, it will also coincide with our Monthly Technique Challenge!! I really love these ARTSYfARTSY stamps. I used the Chalkboard Flowers to create the background and embossed in detail white embossing powder. I then laid a piece of parchment paper on top of it!! I stamped and embossed the butterfly the same way. I received some happy mail today and it included some yummy Wink of Stella pens!!! LOVE!!! I tried coloring the butterfly with about 4 of the colors, but the color does not show well on black cardstock, as it does on white. Here is a shot of the finished inside of the card, as well as a better shot of the colors on the butterfly!! It really does look prettier in person. The shot below still doesn't do the pens any justice, but you can see a little shimmer. This is gorgeous! Love the background and all the embossing. The inside is as pretty as the outside. So glad you shared it with us for the Sparkle N Sprinkle Creative Challenge. Such a beautiful card!! Love what you did with the stamps! Black and white, a great combination!!! Love that you did some stamping inside as well!! What a lovely card. Very nice. Just love the butterfly. How striking- and bet the shimmer IRL is just so fab! Love the idea of adding parchment over the embossing. 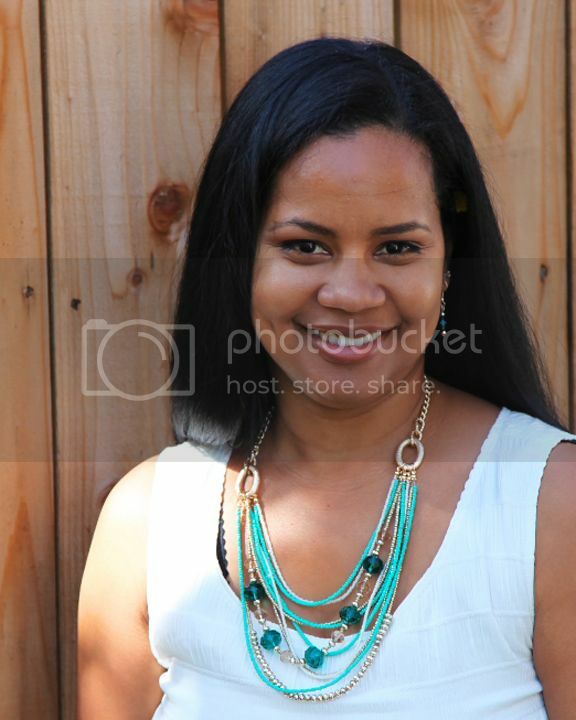 And, the color of the Wink of Stella- I can see a touch of it in your picture- know that is fab IRL! 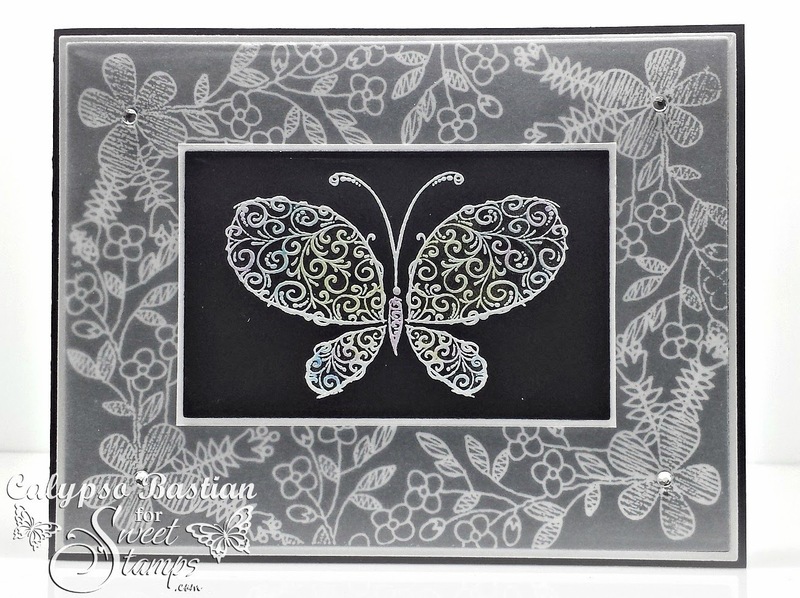 Awesome card, I love the embossed chalkboard design with the parchment overlay and the wonderful butterfly. Gosh, Calypso! this is so elegant, and very striking against the black and the vellum! Gorgeous card with the embossing. It must look magnificent in person, if it looks this pretty photographed! I like that hint of gold in the butterfly. (it must be disappointing that the other colors don't show well), but your project with all those combined techniques is amazing! Very nice use of the sets and the color combo. 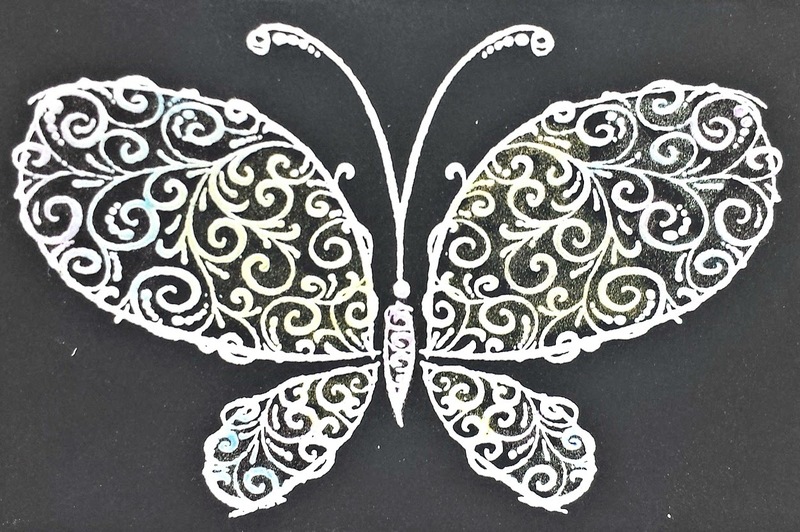 Great card,, love the embossed butterfly! Thanks for joining us at the Sparkle N Sprinkle Challenge this month!